"The Emperor [not wanting to be overdressed]: I don't want to blind them, I just want them to blink a little." Fashion brands continue to expend exorbitant amounts of money for new digital and online channels to make their brands the 'new hotness'. Usually these digital campaigns go unseen. So how to get hipsters, Gen Z and Millennials to buy into a fashion or a brand? Is it a cool Snapchat campaign? Or Instagram stories media blitz? Or banner ads on Facebook? The answer is no. Or sure, you can throw your money away. These are akin to a person handing flyers out in front of Target, Wal-Mart or the subway station. Are you marketing to them? Yes. Are you creating interest? Maybe. Do they remember your pitch? Undetermined. Do people buy what you are selling on the flyer? Probably not. Usually the flyers are left for the parking lot sweepers to push into a ball and throw into the rubbish. Back in 2013, I wrote an article in Enterprise Innovation about affinity ratios stating that if you want a nearly-automatic guarantee someone is going to purchase, create an affinity. An affinity is an automatic trust. How to create an affinity? I wrote, "Affinity initiates with the same beginnings: same hometown, same university, same degree, same professor. The more places the two of you share – someone from your hometown, someone who has also traveled to multiple places – the stronger the bond that’s created. It’s as if you found someone who knows where you came from and also knows how hard it was to get out of your hometown and make it this far. As Singapore Fashion Week begins this October 26-28 with the inaugural fashion tech summit, Zipcode, making its debut to discuss the tapestry of technology and chic, a focal point should be made about the story of fashion. People buy top dollar for a convincing story. Story creates affinity. Not the history of all fashion and why skinny pants are the new 'it'. I also do not mean the story behind the brand ambassadors. Although from an estimated ad recall lift perspective we do see superstars as persons of influence. But they do not create an affinity. Am I truly interested in Alfred Dunhill because of Jude Law? Or does my girlfriend go on a buying binge at Topshop because of Natalie Portman at the Oscars? Does the brother feud between Adidas and Puma entice me to choose one shoe over the other? People seek affinity. Something that is in common with their goals, their wants or their past. Affinity can also be empathy. You feel the goals, the wants or the past of the person that created the thing you wanted to purchase. What is the story of your clothes? What you are wearing 'right now'? Who was the designer who came up with the idea? What was their inspiration? Who was the model who wore it on the runway during the fashion show? How did they feel about wearing it? What was the struggle in them getting it mass produced? Who was the seamstress on the assembly line who stitched your particular clothes together? Who was the driver who drove the truck to your store where you tried it on? Or brought it to the online warehouse where it was deposited? Who was the person who shipped your clothes to you? Or if in a store, who were the people that tried on your outfit in the dressing room before you bought it? This is what I call the concept of #thenakedemperors. Naked being the keyword. A transparent marketing campaign that shows the world everything. From the vision, the conception and the creation to the reveal and how it got to be on your body. And going even further, the life of your clothes with you wearing them. Maybe even further, to the point of when you donate the clothes to charity or hand them down to family and friends. As Wikipedia explains: a barcode is an optical, machine-readable, representation of data; the data usually describes something about the object that carries the barcode. Originally barcode systematically represented data by varying the widths and spacings of parallel lines, and may be referred to as linear or one-dimensional. Barcodes have not really changed or evolved since their birth in 1974. And if not the barcode, hashing the brand label. 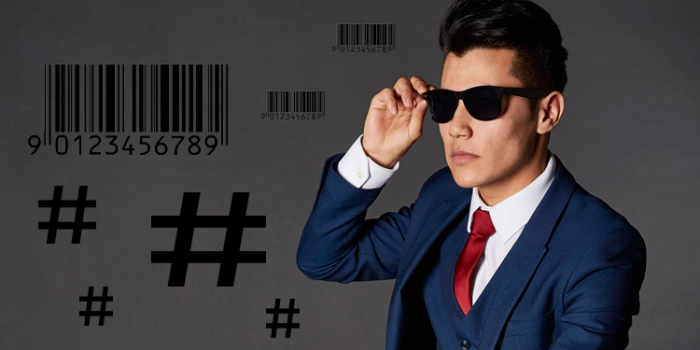 What if we replaced labels or barcodes with hashtags? Especially now as Twitter is doubling the number of characters that a person can tweet to 280. With a hashtag representing an individual piece of clothing – listing its designer, the factory it was created, the transportation company that brought it, to the store number it arrived at – hashtag tracking can allow consumers to follow the story of their clothes. 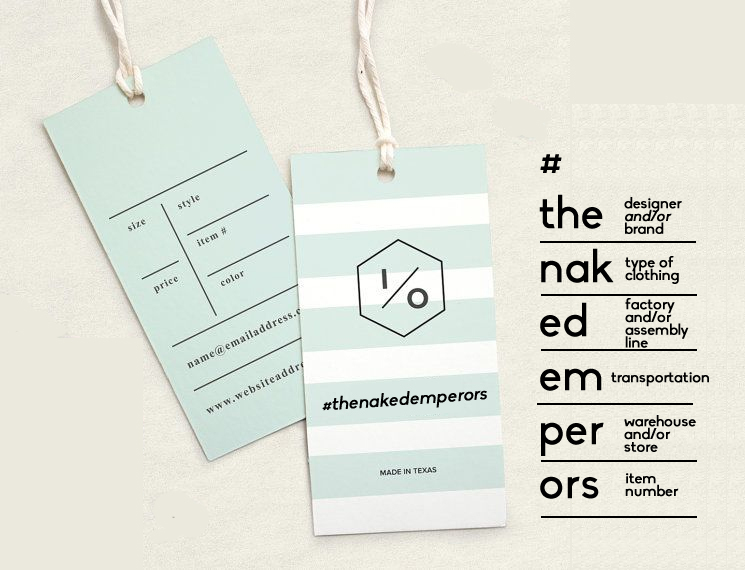 #thenakedemperors a 16-character representation of what's needed to reinvent the barcode. The first three characters representing the designer or the brand, the second three characters representing the type of clothing – pants, skirt, blouse – the third place being two characters representing the factory or assembly line, fourth is two characters representing the transportation or driver, sixth three double characters representing the warehouse or the store sent to and last but not least the final three numbers being the item number. Along every point of distribution from idea to manufacturing using social media to create videos, blogs, short video form to create the story of the clothing glued together via the hashtag. In the dressing rooms putting up signs for people who try on clothes to take selfies using the hashtag so you can see the others who tried on the clothes before them. Able to tweet the hashtag to complain about quality of a piece of clothing in order to investigate supply chains. If a person loses a piece of clothing tweeting the hashtag to see if someone finds it. If you want to see other people wearing your type of blouse or pants – simply use the first six characters of the hashtag to see the see different styles of the same type of clothing including those who have already purchased or those in real time who are purchasing. In order to do the trace, create hash tracking app functionality that goes across Facebook, Twitter, Instagram, Snapchat or any future social media tools such as how Keyhole functions. In order to disrupt the fashion and designer brand-making business is a simple 16-character hashtag. A pennies-on-the-dollar expenditure to create affinity between consumers and product. Note that it will transparently show you what your advertising agency does not – the real living and breathing brand ambassadors – your actual customers. You can even trace marketing campaigns in real time back to actual product purchases on a daily expenditure summary. Future social media banner ads and YouTube pre-roll ads using expensive Hollywood brand ambassadors can be replaced in real time with Instagram stories or Snapchats of people the viewer knows – family and friends – right now who are trying on or who have just purchased the brand because they tagged #thenakedemperors publicly. Affinity opens the eyes of your potential customers. Not blind them with science.